KBW's Jerry Price lands a shot during his bout against Kaylan Wells in last week's Kellingley ABC show. KBW Boxing gym had two fighters on the Kellingley ABC show in Knottingley last Saturday with Jerry Price recording an impressive win, while Mohammed Subhaan was edged out on a split decision. Price was up against Kaylan Wells from Scunthorpe ABC and took control of the bout from the opening bell, showcasing his skills and was able to pick off his opponent at will with good work off his jab to the body and head. Wells came out for the second round aiming to apply pressure on the front foot but Price was able to catch his opponent coming in with some sharp counters. Price’s movement was too much for Wells in the final session as he took the bout on a unanimous decision. 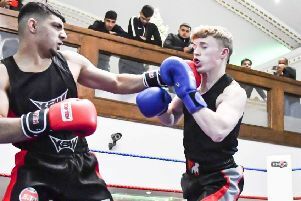 Two of the country’s leading 56kg boxers met as KBW’s Mohammed Subhaan faced Joe Tyres (Darlington) with both men putting on an excellent display of boxing. Both boxers opened the bout with sharp jabs, trying to judge each other’s distance and catch each other on the counter. Tyres was trying to close the gap and take his attack to Subhaan’s body, while the Dewsbury man was using his reach advantage to keep his opponent at bay. The work rate increased in the second round as Subhaan kept the fight at long range, while Tyres boxed on the inside and landing his blows to the body. The action was back and forth and the crowd were really engrossed in a cracking and evenly fought bout. Subhaan opened the third and final round with a beautiful one-two combination and the KBW man stayed in close with Tyres as both boxers attempted to create angles to throw and land their shots. The action was relentless and for the last 10 seconds of the round, both men stood toe to toe, which earned a standing ovation from the crowd. The bout was awarded to Tyres by split decision, although many ringside observers had struggled to separate the two boxers and believed the contest had ended in a draw. Both boxers showed huge respect for each other at the end of the bout and a rematch looks certain to take place.